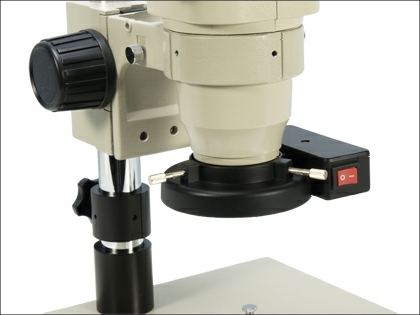 The Brunel ring light will fit all our zoom stereomicroscopes with the appropriate adapter. They may also fit other makes providing the stereohead has a parallel sided cowling and is less than 65mm in diameter. The unit consists of a fluorescent circular strip light which attaches to the bottom of the stereohead. The ring light is 240v with an on/off switch and provides excellent vertical illumination that is softer than LED lighting which is ideal for electronics and other fine manipulations where light flare and highpoints could be a problem.. A really cost effective alternative to the expense of a fibre optic ring light.